Available Colors: Yellow-Blue-Green-Orange-Red-White-Black, -Light Blue etc. Twin available: 0.060 grm to 0.500 grm, 40,50,100, 200 & 300 mtr. Size: 0.5mm to 3mm and 3ply to 108ply of 380 Denier. As a quality focused firm, we are engaged in offering a high quality range of HDPE Twine Spool. We are engaged in manufacturing and supplying of optimum quality HDPE Twine. The HDPE Twine we offer is fabricated from superior quality material to ensure resistance against harshest conditions. Our hank form HDPE Twine is applicable for various industrial purposes all over the world. We manufacture HDPE Twine in more then 16 colors.Our twine comes with bright colors and extra strength. 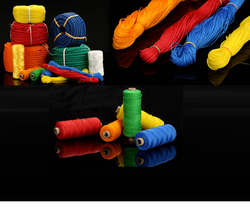 We are dedicatedly engaged in manufacturing a commendable range of HDPE Twine. Backed by a team of skilled professionals, we are highly engaged in offering a wide range of HDPE Twine.